We'll periodically update this post- so make sure you're on our mailing list or follow us on Facebook. It's that time of year again! Time to dust off the two-wheeler and show it off at your nearest gathering spot. Here's our list of bike nights, gatherings and weekly happenings around the state of Oklahoma. 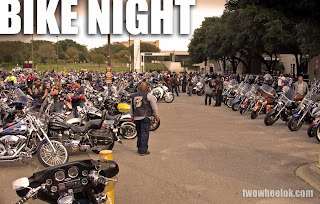 If you have details on a weekly bike night in your area let us know about it. Bike nights are fun. It's a chance for everyone to get together, tell a few lies, kick tires and bench race. It's not a good time to get loaded and ride drunk. Please drink responsibly and always ride safe. Freddie's- Tulsa: Freddie's Frozen Custard on 71st Street hosts a bike night every Monday beginning at 6:00 pm. Louie's Sports Grill- Tulsa: Bike/Cool Rides Night every Tuesday night from 6:00-10:00 at Louie's in Broken Arrow on Lynn Lane (North of BA Expressway, west side of street). Specials include 1/2 price appetizers & drink specials! Acoustic entertainment. Family-friendly. Mooney's Pub & Grill- Norman: Hosts a bike night on Wednesdays featuring live music and drink specials. They're located on I-35 service road between South 19th and Indian Hills Road. I-240- Oklahoma City: Sponsored by Hooters and Old Chicago and happening every Thursday starting in April. Located on the service road along (you guessed it!) Interstate 240. Meyers-Duren- Tulsa: The third Thursday of the month (except October) is the night to cruise down Peoria and drop in on Myers-Duren Harley Davidson. Twin Peaks- Tulsa: Tons of bikes of all types show up for giveaways and gab on South Memorial just north of 71st Street. Sonic- Tulsa: This is an informal gathering of folks from the Tulsa Sportbike Riders group at the Sonic on Brookside. Fort Thunder H-D- Moore: Check out their bike night every Friday evening from 6:00 to 9:00 pm. Located just off I-35 at 500 SW 11th Street in Moore. Seaba Station- Warwick- Not really a bike "night" so much as a bike "morning." On the third Sunday of each month Seaba hosts a ride-in. Breakfast and lunch are available and, as always, museum admission is free. Concessions are now available every weekend. Maybe there are more? Maybe you should tell us about them! Be sure to include an address and a web link if possible.